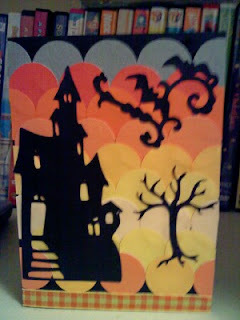 I got this idea from Paper Crafts Magazine Sept/Oct issue. Using an A7 card as the base I cut 1 inch circles of 7 different papers. Starting at the top of the card base I placed the first set of circles and then layered on top working my way down the card base. *I ran out of colors for the gradient scallop and had already put my E away for the night so I used some additional circles of colors I had already cut at the bottom* The haunted house is one of my files. I will post it after this post. The tree is from the Make The Cut Gallery but a popular tree punch of other tree would work just fine if you don't have MTC. The bat flourish at the top was a free file from the fabulous Mary and Leo at SVG Cuts. Please leave me a comment to let me know what you think!